For the Paul & Joe spring/summer 2016 ready-to-wear collection, Sophie Albou goes young	surfing the USA. Metallic fabrics and tropical prints are key elements this season, and may remind some of you of Paul & Joe’s SS 2016 menswear collection, which took great advantage from this summer-y mood offering palm tree prints and Hawaiian shirts. These connections with her menswear collection do not end here: in fact, as we approach the heart of the line-up, we instantly spot Albou’s desire to give her womenswear line a more boyish attitude, which combines fashion trends from the Nineties with those from the next summer 2016. Being the daughter of a clothing-company executive and of a fashion designer, Sophie Albou has always been a fashion enthusiast (a similar destiny she shares with compatriot Vanessa Bruno). Paris-based Albou founded her clothing line Paul & Joe in the mid-90s, which releases a menswear and a womanswear collection each season. She has often worked as a designer for many American fast-fashion companies, like Target, and we may say more in general that she gives her best when designing limited edition lines. In line with her clothing collections, she has recently started a houseware line that takes inspiration from the motifs and prints used in her ready-to-wear collections. As we are about to see, the French fashion designers loves to mix every single aspect of her working life, menswear and womenswear’s collections included. Those who instantly loved these fashion weeks’ main trends, like the futuristic trend and the boyish cuts, but are looking for a more ready-to-wear collection, will probably fall in love with Albou’s Paul & Joe spring 2016 collection and with what seems to be her coast to coast trip around the United States of America. 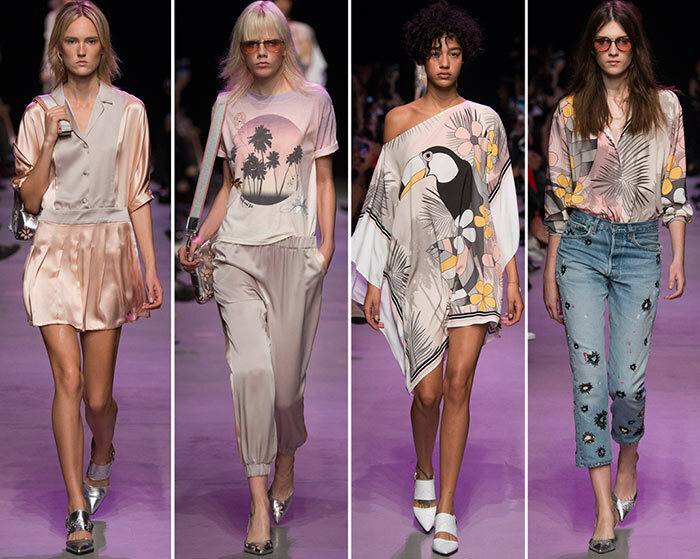 The first part of the line-up takes us to the East Cost, Florida, and introduces us to sleek pink fabrics and pink palm tree prints, which adorn mannish suits, swimsuits and oversized shirts. 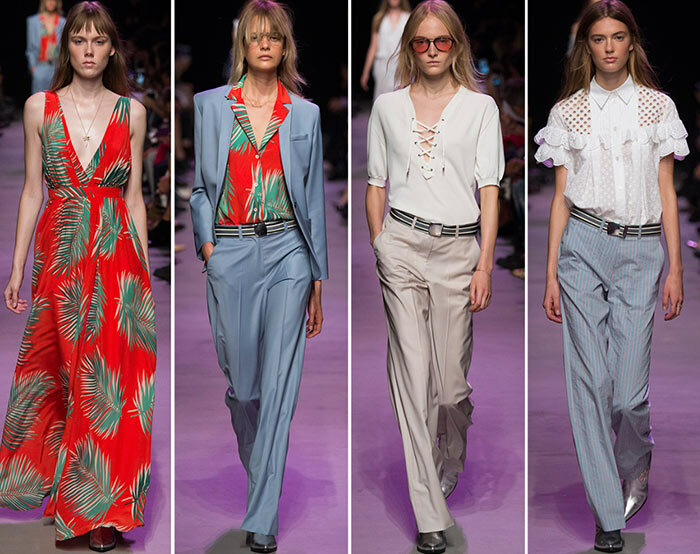 Sleek short jumpsuits and peg-top pants take us to the next phase, which is probably also the most casual part of the collection. Here we welcome late-Seventies-inspired outfits that include casual digger jeans, printed shirts and even ‘plain’ little back dresses, adorned with lace embroideries and combined with ankle boots. We may say that, from the East Coast, we have jumped to the Midwest. From the Midwest to Las Vegas, the third part of the collection goes metallic and shows even more bare skin, thanks to the oversized shirtdresses, deep V-necklines and skimpy bikinis, covered with metallic-green palm motifs. As a fluid continuum of fashion styles, the metallic palm tree motifs flow into a boyish turnaround bringing sleek light blue suits with printed red shirts. The upcoming looks, instead, like to mix femininity with masculinity, playing with off-the-shoulder dresses, ruffled shirts, and pink dresses, both long and short. The finale of the Paul & Joe spring 2016 runway show finally takes us to California with its Havana motifs and surfer-approved clothing pieces. 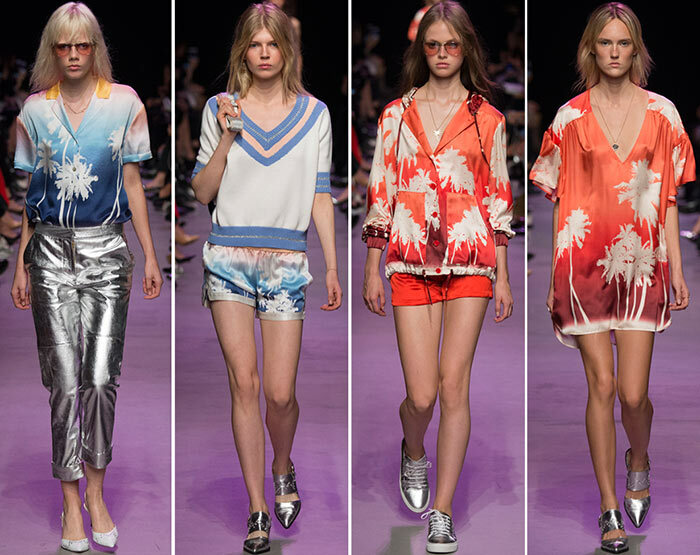 Tennis blouses, short Hawaiian shorts and front-split long skirts are just a few examples of this range of looks, which skillfully combines all the other main styles and motifs spotted throughout the line-up. Last but not least, we should not neglect Albou’s shoe offerings, because it is also thanks to the stylish pointy-toe shoes and metallic sneakers that the Paul & Joe spring/summer 2016 line-up has travelled successfully from Florida to California.